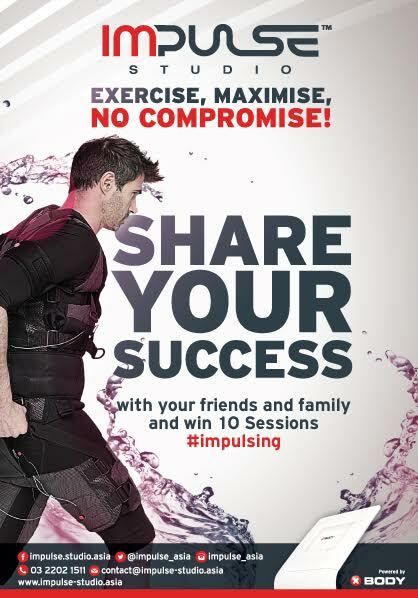 Tag #impulsing and Win FREE 10 SESSIONS OF IMPULSE TRAINING! Have been feeling good about yourself lately with our training? You want more of our training? You want to see much more great result? Then, join this competition to reward yourself for 10 FREE sessions. Share your success story with your friends and families by tagging #impulsing and you might just win sessions from us! How cool is that? This competition is only until August 2015 so grab this chance NOW! Please refer to T&C below. The competition is open to everyone except employees of Impulse Studio and their close relatives and anyone otherwise connected with the organisation or judging of the contest. Closing date for entry will be on 31st July 2015. After this date no further entries to the contest will be permitted. The entrant must be following @impulse_asia on Twitter in order to enter. The entrant must be following @impulse_asia on Instagram in order to enter. The entrant must like Impulse Studio on Facebook in order to enter. The entrant must tag #impulsing in order to enter. Impulse Studio shall have the right, at its sole discretion and at any time, to change or modify these terms and conditions, such change shall be effective immediately upon posting to this webpage. Impulse Studio also reserves the right to cancel the competition if circumstances arise outside of its control. Impulse Studio is not responsible for inaccurate prize details supplied to any entrant by any third party connected with this competition. The prize is as stated and no cash or other alternatives will be offered. The prizes are not transferable. We reserve the right to substitute any prize with another of equivalent value without giving notice. Winners will be chosen by the highest number of shared post and the highest number of posting. The winner will be notified by email and/or DM on Twitter/Facebook/Instagram within 30 days of the closing date. If the winner cannot be contacted or do not claim the prize within 14 days of notification, we reserve the right to withdraw the prize from the winner and pick a replacement winner. Impulse Studio will notify the winner when and where the prize can be collected / is delivered. Impulse Studio’s decision in respect of all matters to do with the competition will be final and no correspondence will be entered into. The competition and these terms and conditions will be governed by Malaysia law and any disputes will be subject to the exclusive jurisdiction of the courts of Malaysia. This promotion is in no way sponsored, endorsed or administered by, or associated with, Facebook, Twitter or any other Social Network. You are providing your information to Impulse Studio and not to any other party. To see how it’s done, take a look at Kong Eu’s video!